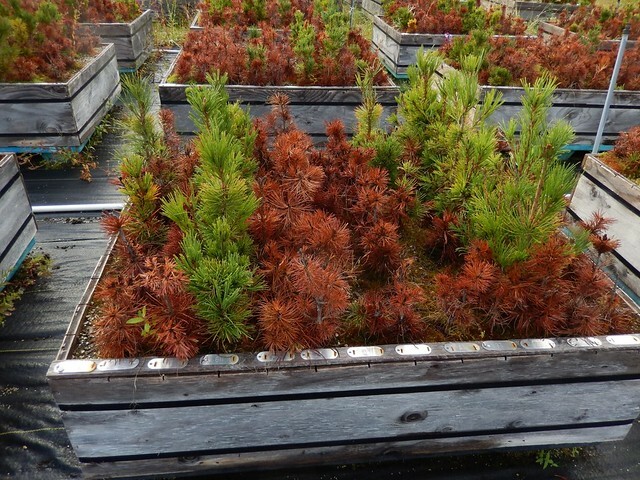 Whitebark pine trees with variable resistance to white pine blister rust. Photo credit: Richard Sniezko. Why all this emphasis on time and longevity? Trees can tell us a lot about the histories of their ecosystems. Knowing these histories can help us develop plans to sustainably manage healthy forests into the future, which is in keeping with USDA’s strategic goals to ‘strengthen stewardship of private lands,’ and to ‘foster productive and sustainable use of our national forest system[s].’ In other words, any plan for a healthy forest today must also account for tomorrow, and the tomorrows after that. Careful stewardship and impactful research are especially important today because insect pests and diseases, many of which are nonnative, are putting relentless pressure on the nation’s forests. The repercussions of these pests are not limited to the trees they effect; unhealthy forests can impact human health, threaten local economies and clean water supplies, and dramatically alter ecosystems. Forest pests are not novelties. In fact, some of the earliest known outbreaks of nonnative insects and diseases reach back to the 1890’s with white blister pine rust, or the chestnut blight of the early 1900s, which nearly wiped out the American chestnut. A more recent discovery, the invasive Emerald Ash Borer beetle, led to the listing of five different U.S. ash species as critically endangered. While pests and diseases pose serious threats to our nation’s forests and private lands, wise stewardship and careful research can provide solutions. USDA Forest Service (FS) tree breeders and scientists are working to breed populations of trees resistant to today’s pests and diseases that maintain enough natural variation to grow for generations through the unforeseen challenges of tomorrow. Earlier this year, FS tree breeders told stories of their efforts to maintain and restore forest health through research and partnerships with states, tribes, National Parks and many other groups. These initiatives include an ongoing program to breed blister rust resistant white pines and use them in restoration plans. More recently, FS scientists began working with the few ash trees that can survive Emerald Ash Borer infestations, looking for candidate trees for breeding programs. These stories highlight the potential for tree breeding programs to act as avenues for the restoration and sustainability of healthy forests. Curious? Check out the U.S. Forest Service’s Forest Insect and Disease Reporting Portal or reach out to the breeders: Jennifer Koch, Dana Nelson, and Richard Sniezko. This is a very interesting blog and helps me understand what tree breeding is all about. Thank you.